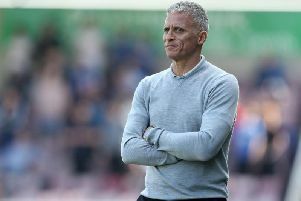 Rob Page said he couldn’t fault the effort of his players but the Cobblers boss admitted to his disappointment at the manner of the goals they conceded in their 3-1 defeat to Manchester United. United arrived at Sixfields with an embarrassment of riches and they were given a helping hand by the Cobblers, in particular goalkeeper Adam Smith. Smith’s decision to pick up Matty Taylor’s back-pass led to Michael Carrick’s opener before Alex Revell brought Northampton level from the penalty spot. But Ander Herrera’s sweet strike put United back in front before another howler from Smith, this time when he failed to clear his lines, gifted Marcus Rashford a killer third goal. And despite the calibre of their opponents, Page couldn’t help but feel frustrated afterwards. “I’m disappointed,” he said. “When you go through the goals, I think we’ve had a hand in all three and when you give goals away like that at any level, you’re going to get punished, especially against a very good team in Man United. “That’s what disappoints me, but their effort was outstanding tonight. “We knew they would have a large spell of possession and they did so and we knew we had to be hardworking in our defensive shape which we were. On Smith’s difficult night, Page continued: “I think it was just a lapse of concentration. “He’s been outstanding this season and he was outstanding last season so we’re not going to beat him up too much about it. Nevertheless, there were times when Cobblers visibly and genuinely rattled their Premier League opponents, none more so than in a five-minute flurry before half-time when Kenji Gorre hit the crossbar and Revell tucked away the penalty. Page added: “Kenji had a great shot which the keeper tips onto the bar and then we get the penalty. We knew chances would be few and far between so it was important that when we got them, we took them. “We got the penalty and got ourselves back into the game, and the game plan was to frustrate them and be defensively well-organised in our shape.